Villa Colet has everything you need for an enjoyable holiday, from its position right by Pollensa Old Town to the views over the town and mountains. Pollensa has a good selection of traditional restaurants and shops, a beautiful and historic church and superb scenery! Plus, a choice of fantastic beaches can be found within a short drive. This charming 2 bedroom house also has a large private swimming pool, a spacious lawned garden, and includes air conditioning/heating in the lounge and bedrooms as well as WiFi. Villa Colet has fantastic views over the nearby mountains, as well as Pollensa Old Town which is right on your doorstep! 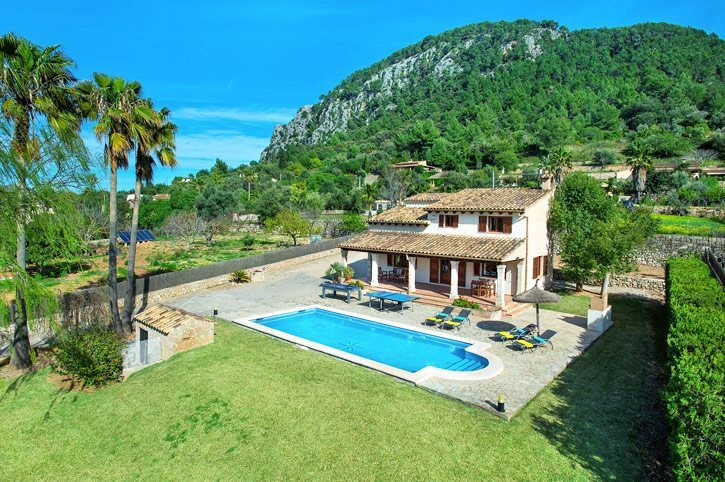 Aside from its excellent position, one of the highlights of Villa Colet is no doubt its fantastic private swimming pool and spacious lawned garden where you can enjoy views over the surrounding countryside to the tops of the Tramuntana Mountains. The brick BBQ is to one side of the garden whilst the exterior table and chairs is shaded, where you can dine in comfort out of the sun. The private parking area at Villa Colet is gated from the lane and offers ample space for your hire car. The living area at Villa Colet is decorated in a traditional style, with tiled floors and wooden beamed ceilings, and is of a typical open plan design. The lounge has plenty of seating and there is a dining table and chairs for 4. The adjacent kitchen is fully equipped and also has a smaller breakfast table. Patio doors from the lounge open onto the pool terrace. There's a shower room on the ground floor. Upstairs is a double bedroom and twin bedroom, sharing a separate shower room. Both bedrooms have fantastic views over the villa grounds towards Pollensa Old Town and the mountains. Villa Colet is positioned right by Pollensa Old Town. This beautiful and historic area has a good choice of authentic tapas restaurants, cafes and quaint shops to explore. Plus, you can also browse the lively Sunday market or wander along the narrow cobbled streets and up the steps to the Calvari Church. The nearest beaches are the 2 small coves of Cala San Vicente, a short drive north, although a number of excellent alternative beaches are also within easy reach by car. Villa Ca Na Lida is next door. Keen shoppers will be in their element! The old town is host to a popular weekly market every Sunday between 10am and 12pm, which offers fresh fruit and vegetables, flowers and souvenirs to take home. You'll also find a number of quaint gift shops along the cobbled streets. Pollensa (Pollenca) Old Town is filled with traditional restaurants where you can enjoy a tasty tapas or paella. The town really comes to life at night and offers a great bustling atmosphere. Neighbouring Alcudia offers something for everyone, from the authentic eateries in the old town to a fine dining experience by the port. For a choice of more modern restaurants and cuisine, head to Puerto Pollensa (Puerto Pollenca). Its famous Pine Walk is lined with fashionable bistros overlooking the sea. The nearest beaches are the small sandy coves of Cala San Vicente which are reached by steps from the main street. The beautiful hidden beach of Playa de Formentor is around 30 minutes' drive further along the coast - the hillside drive offers spectacular scenery so make sure you have your camera ready! Or, if you prefer a larger, more lively beach, visit either Puerto Pollensa or Alcudia, which both have huge sandy bays lined with a choice of seafront cafes, bars and restaurants. Families with younger children should head to Hidropark Alcudia, 20 minutes' drive away, which has a number of pools and water-based rides and activities. Alcudia also has a go-karting track. Golf Pollensa is only 2 miles away. Keen golfers might also like to try the popular Golf Alcanada course in Alcudia, around 25 minutes away by car. Both Puerto Pollensa and Alcudia beaches have a choice of water sports facilities available. Drier pursuits include hiking in the Tramuntana Mountains as well as exploring the S'Albufera Nature Reserve. Villa Colet is not available to book for season as it is sold out. Take a look here at the Majorca villas that are currently on sale.